This luxury camping resort is located within the Argeles-sur-Mer region of France and only 200 metres from the coast of the Mediterranean Sea. Not only do numerous seaside activities abound, but the surrounding natural environment is ideal for couples as well as for the entire family. To discover more about this holiday camping destination, please speak with a Lux-Camp representative at your convenience. 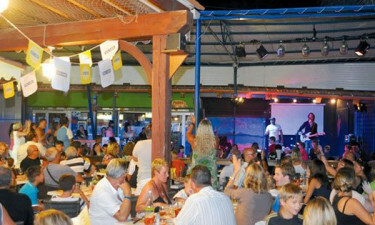 Why Should I Camp at Camping Le Front de Mer? Supervised entertainment is provided for all children. It is possible to stay in spacious mobile homes. 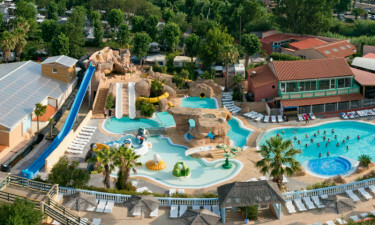 A large water park is perfect for the young and the old alike. Wireless internet services are provided throughout this holiday camping site. Any camping holiday here will be complemented by the proximity of this site to natural beaches (approximately 15 minutes by foot). Besides the water park, there is a large covered pool found within Le Front de Mer. Communal barbecues, a laundrette, a sanitary station for children and a cash point are likewise available to all guests within this luxury camping site. Camping Le Front de Mer provides on-site dining, thanks to a restaurant that serves traditional cuisine from the Pyrénées Orientales. A snack bar and a grocery store will provide hot and cold treats. Full takeaway meals are also available to those who wish to dine within their mobile home. A small kiosk offers tourist-related products such as newspapers, magazines and souvenirs, and common camping needs.